Which is More Technologically Advanced–Star Wars or Star Trek? Let’s compare the two, side-by-side. First up, we have Star Wars’ hyper engines that go through hyperspace compared to Star Trek’s warp drives that travel through normal space at FTL (“faster than light”) speeds. Technical data books indicate that the speeds and range of hyper drives are greater, however. We have also repulsor craft that hover over the ground in the Empire, but not much is shown of Federation ground transport, although anti-grav units are used to move heavy objects. But the Federation has one edge: teleportation. I’m going to consider them even here, based on having different advantages. Both empires seem to be able to produce unlimited power for their needs. The amount directed to any one use might be limited, but fuel seems to be endless. While the exact fuel for the Empire is unclear, it seems to be on-par with the Federation’s antimatter engines (although often at much larger scales, e.g. The Death Star). Both spacefaring civilizations have FTL communication that is not instantaneous at long distances. There are language translators that work in real time in the Federation, but these might just be for explorers. Citizens of the Empire seem to prefer being polyglot, but protocol droids are available for translation. The Federation is able to use replicators to nearly instantly produce food, durable goods and tools. Apparently it cannot produce all elements and molecules; perhaps needed is a “base supply” of matter to convert into finished items, rather than just converting energy into matter directly. But holodecks have shown that it can instantly produce and break down the matter it works with. The Empire, especially on the frontier, depends on trade. The movement of rare resources and finished goods is the center of their economy, indicating that they have no similar manufacturing capability. Plus one for the Federation. Both civilizations build large spaceships in orbit. While the Federation can produce starbases which are large cities, the Empire makes Star Destroyers and was able to produce two Death Stars (one in secret). It seems that Empire construction methods are superior. Plus one for the Empire. Ground troops for both civilizations make use of hand-held energy weapons, some of which are powerful enough to vaporize their target, although the later are not commonly used (too few shots?) Neither seem to use personal energy shields. Vehicles similarly use weapons the scale-up with the size of the vehicle, although vehicles are large enough that they can supply the energy needed to maintain shields that defend against energy weapons. 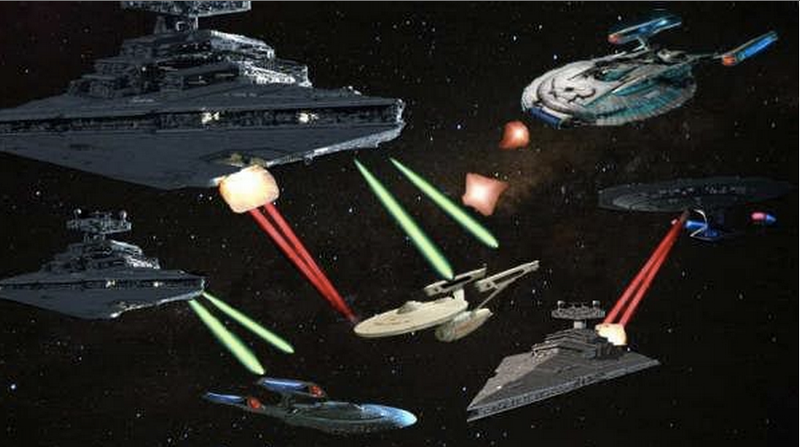 The extremely large size of Empire ships mean large shields, thus fighters are more heavily used to penetrate the shields physically and then deliver weapons attacks. But the two seem to be on-par technologically here and I don’t see one side having an advantage over the other, should they fight each other with the same mass of ships or number of ground troops with air support. Severe injuries that do not result in brain death seem to be reparable. For some reason the Federation seems to be plagued with hundreds of rare and hard-to-identify diseases on its border (more often across it, perhaps). But they are able to treat them with a minimum of fatalities. Both civilizations are also known to use cloning technology (in secret) and to genetically modify members for specialty purposes (again, rarely). Lack of firm details here results in another tie. The Empire has a love of creating seemingly sentient robots to function as servants. The Federation has produced many robots, but does not tend to use them alongside human crews. Use in construction and other off-camera activities seems to be the primary use. But then, the two sentient Star Trek robots (Data and Lore) are afforded full human rights (and criminal responsibility for their actions), possibly unlike in the Empire. Certainly the difficulty in production is not rewarded by an economic return of gaining a specialized servant. The Federation does seem to prefer using semi-sentient computers for their starships, however. There is no sign that The Empire does this with their ships. In fact, you often need a droid to interface with the ship computer. Both empires have mastered the control of projected fields, artificial gravity, ship integrity fields and so on. Shield generators are standard gear for starships and can be placed in ground installations. Some cloaking technology exists for both, as does projecting holograms. Although this is not being factored in here, I would like to point out that the smaller Federation has made use of social institutions which are more “advanced” than the Empire. The Federation is a non-discriminating, post-scarcity economy which no longer uses money and is interested in the betterment of all of its citizens equally. The Empire exists as a feudal state (or Republic, before and after the rise of the Empire) with slavery common, an unequal sharing of resources, and a culture that accepts bounty hunters and smugglers, at least on the fringes of civilization. The Federation has transporters, personal translators, holodecks and replicators. The Empire has droids, faster/further warp drive travel, massive construction projects, energy generation that scales linearly with its construction projects, and cybernetics. Also keep in mind that the Empire is much, much larger. It spans the entire galaxy. There are civilizations in the Federation’s galaxy whose technology dwarfs both the Federation and the Empire. Which is the more technologically advanced civilization—the Federation of Star Trek or the Galactic Republic of Star Wars? originally appeared on Quora.